Neben monogenen Formen und Hauptgen-Effekten sind für die genetische Prädisposition zur Adipositas polygene Mechanismen relevant. 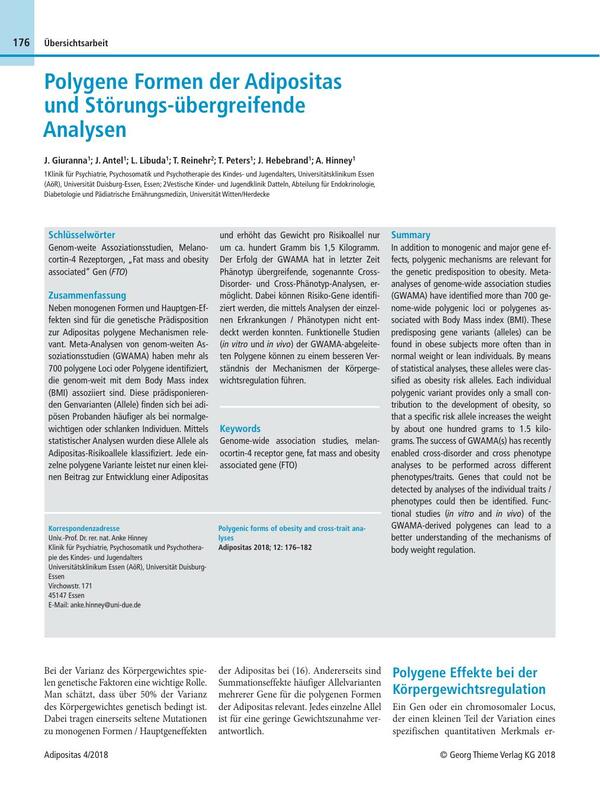 Meta-Analysen von genom-weiten Assoziationsstudien (GWAMA) haben mehr als 700 polygene Loci oder Polygene identifiziert, die genom-weit mit dem Body Mass index (BMI) assoziiert sind. Diese prädisponierenden Genvarianten (Allele) finden sich bei adipösen Probanden häufiger als bei normalgewichtigen oder schlanken Individuen. Mittels statistischer Analysen wurden diese Allele als Adipositas-Risikoallele klassifiziert. Jede einzelne polygene Variante leistet nur einen kleinen Beitrag zur Entwicklung einer Adipositas und erhöht das Gewicht pro Risikoallel nur um ca. hundert Gramm bis 1,5 Kilogramm. Der Erfolg der GWAMA hat in letzter Zeit Phänotyp übergreifende, sogenannte Cross- Disorder- und Cross-Phänotyp-Analysen, ermöglicht. Dabei können Risiko-Gene identifiziert werden, die mittels Analysen der einzelnen Erkrankungen / Phänotypen nicht entdeckt werden konnten. Funktionelle Studien (in vitro und in vivo) der GWAMA-abgeleiteten Polygene können zu einem besseren Verständnis der Mechanismen der Körpergewichtsregulation führen. In addition to monogenic and major gene effects, polygenic mechanisms are relevant for the genetic predisposition to obesity. Metaanalyses of genome-wide association studies (GWAMA) have identified more than 700 genome-wide polygenic loci or polygenes associated with Body Mass index (BMI). These predisposing gene variants (alleles) can be found in obese subjects more often than in normal weight or lean individuals. By means of statistical analyses, these alleles were classified as obesity risk alleles. Each individual polygenic variant provides only a small contribution to the development of obesity, so that a specific risk allele increases the weight by about one hundred grams to 1.5 kilograms. The success of GWAMA(s) has recently enabled cross-disorder and cross phenotype analyses to be performed across different phenotypes/traits. Genes that could not be detected by analyses of the individual traits/phenotypes could then be identified. Functional studies (in vitro and in vivo) of the GWAMA-derived polygenes can lead to a better understanding of the mechanisms of body weight regulation. 1 Akiyama M, Okada Y, Kanai M, Takahashi A, Momozawa Y, Ikeda M. et al. Genome-wide association study identifies 112 new loci for body mass index in the Japanese population. Nat Genet 2017; 49: 1458-1467. 3 Boissel S, Reish O, Proulx K, Kawagoe-Takaki H, Sedgwick B, Yeo GS. et al. Loss-of-Function Mutation in the Dioxygenase-Encoding FTO Gene Causes Severe Growth Retardation and Multiple Malformations. Am J Hum Genet 2009; 85: 106-11. 4 Boraska V, Franklin CS, Floyd JA, Thornton LM, Huckins LM, Southam L. et al. A genome-wide association study of anorexia nervosa. Mol Psychiatry 2014; 19: 1085-94. 5 Bradfield JP, Taal HR, Timpson NJ, Scherag A, Lecoeur C, Warrington NM. et al. A genome-wide association meta-analysis identifies new childhood obesity loci. Nat Genet 2012; 44: 526-31. 6 Bulik-Sullivan B, Finucane HK, Anttila V, Gusev A, Day FR, Loh PR. et al. An atlas of genetic correlations across human diseases and traits. Nat Genet 2015; 47: 1236-41. 7 Church C, Moir L, McMurray F, Girard C, Banks GT, Teboul L. et al. Overexpression of Fto leads to increased food intake and results in obesity. Nat Genet 2010; 42: 1086-92. 8 Claussnitzer M, Dankel SN, Kim KH, Quon G, Meuleman W, Haugen C. et al. FTO Obesity Variant Circuitry and Adipocyte Browning in Humans. N Engl J Med 2015; 373: 895-907. 9 Dudbridge F, Gusnanto A. Estimation of significance thresholds for genomewide association scans. Genet Epidemiol 2008; 32: 227-34. 10 Felix JF, Bradfield JP, Monnereau C, van der Valk RJ, Stergiakouli E, Chesi A. et al. Genome-wide association analysis identifies three new susceptibility loci for childhood body mass index. Hum Mol Genet 2016; 25: 389-403. 11 Fischer J, Koch L, Emmerling C, Vierkotten J, Peters T, Brüning JC. et al. Inactivation of the Fto gene protects from obesity. Nature 2009; 458: 894-8. 12 Frayling TM, Timpson NJ, Weedon MN, Zeggini E, Freathy RM, Lindgren CM. et al. A common variant in the FTO gene is associated with body mass index and predisposes to childhood and adult obesity. Science 2007; 316: 889-94. 13 Geller F, Reichwald K, Dempfle A, Illig T, Vollmert C, Herpertz S. et al. Melanocortin-4 receptor gene variant I103 is negatively associated with obesity. Am J Hum Genet 2004; 74: 572-81. 14 Hebebrand J, Hinney A, Knoll N, Volckmar AL, Scherag A. Molecular genetic aspects of weight regulation. Dtsch Arztebl Int 2013; 110: 338-44. 15 Heid IM, Vollmert C, Hinney A, Döring A, Geller F, Löwel HA. et al. Association of the 103I MC4R allele with decreased body mass in 7937 participants of two population based surveys. J Med Genet 2005; 42: e21. 16 Hermann G, Wabitsch M, von Schnurbein J. Monogene Formen der Adipositas beim Menschen. Adipositas 2018; 12: 162-167. 17 Hinney A, Kesselmeier M, Jall S, Volckmar AL, Föcker M, Antel J. et al. Evidence for three genetic loci involved in both anorexia nervosa risk and variation of body mass index. Mol Psychiatry 2017; 22: 192-201. 18 Hinney A, Nguyen TT, Scherag A, Friedel S, Brönner G, Müller TD. et al. Genome Wide Association (GWA) study for early onset extreme obesity supports the role of fat mass and obesity associated gene (FTO) variants. PLoS One 2007; 02: e1361. 19 Hinney A, Volckmar AL, Knoll N. Melanocortin-4 receptor in energy homeostasis and obesity pathogenesis. Prog Mol Biol Transl Sci 2013; 114: 147-91. 20 Hinney A, Wolters B, Pütter C, Grallert H, Illig T, Hebebrand J. et al. No impact of obesity susceptibility loci on weight regain after a lifestyle intervention in overweight children. J Pediatr Endocrinol Metab 2013; 26: 1209-13. 21 Jarick I, Vogel CI, Scherag S, Schäfer H, Hebebrand J, Hinney A. et al. Novel common copy number variation for early onset extreme obesity on chromosome 11q11 identified by a genomewide analysis. Hum Mol Genet 2011; 20: 840-52. 22 Landgraf K, Scholz M, Kovacs P, Kiess W, Körner FTO. Obesity Risk Variants Are Linked to Adipocyte IRX3 Expression and BMI of Children – Relevance of FTO Variants to Defend Body Weight in Lean Children?. PLoS One 2016; 11: e0161739. 23 Liu X, Hinney A, Scholz M, Scherag A, Tönjes A, Stumvoll M. et al. Indications for potential parent-of-origin effects within the FTO gene. PLoS One 2015; 10: e0119206. 24 Locke AE, Kahali B, Berndt SI, Justice AE, Pers TH, Day FR. et al. Genetic studies of body mass index yield new insights for obesity biology. Nature 2015; 518: 197-206. 25 Loos RJ, Lindgren CM, Li S, Wheeler E, Zhao JH, Prokopenko I. et al. Common variants near MC4R are associated with fat mass, weight and risk of obesity. Nat Genet 2008; 40: 768-75. 26 Meyre D, Proulx K, Kawagoe-Takaki H, Vatin V, Gutiérrez-Aguilar R, Lyon D. et al. Prevalence of loss-of-function FTO mutations in lean and obese individuals. Diabetes 2010; 59: 311-8. 27 Müller TD, Hinney A, Scherag A, Nguyen TT, Schreiner F, Schäfer H. et al. ‘Fat mass and obesity associated’ gene (FTO): no significant association of variant rs9939609 with weight loss in a lifestyle intervention and lipid metabolism markers in German obese children and adolescents. BMC Med Genet 2008; 09: 85. 28 Okbay A, Beauchamp JP, Fontana MA, Lee JJ, Pers TH, Rietveld CA. et al. Genome-wide association study identifies 74 loci associated with educational attainment. Nature 2016; 533: 539-42. 29 Reinehr T, Hebebrand J, Friedel S, Toschke AM, Brumm H, Biebermann H. et al. Lifestyle intervention in obese children with variations in the melanocortin 4 receptor gene. Obesity (Silver Spring) 2009; 17: 382-9. 30 Reinehr T, Hinney A, Nguyen TT, Hebebrand J. Evidence of an influence of a polymorphism near the INSIG2 on weight loss during a lifestyle intervention in obese children and adolescents. Diabetes 2008; 57: 623-6. 31 Reinehr T, Scherag A, Wang HJ, Roth CL, Kleber M, Scherag S. et al. Relationship between MTNR1B (melatonin receptor 1B gene) polymorphism rs10830963 and glucose levels in overweight children and adolescents. Pediatr Diabetes 2011; 12: 435-41. 32 Reinehr T, Wolters B, Roth CL, Hinney A. FTO gene: association to weight regain after lifestyle intervention in overweight children. Horm Res Paediatr 2014; 81: 391-6. 33 Ried JS, Jeff M J, Chu AY, Bragg-Gresham JL, van Dongen J, Huffman JE. et al. A principal component meta-analysis on multiple anthropometric traits identifies novel loci for body shape. Nat Commun 2016; 07: 13357. 34 Scherag A, Dina C, Hinney A, Vatin V, Scherag S, Vogel CI. et al. Two new Loci for body-weight regulation identified in a joint analysis of genome-wide association studies for early-onset extreme obesity in French and German study groups. PLoS Genet 2010; 06: e1000916. 35 Scherag A, Kleber M, Boes T, Kolbe AL, Ruth A, Grallert H. et al. SDCCAG8 obesity alleles and reduced weight loss after a lifestyle intervention in overweight children and adolescents. Obesity (Silver Spring) 2012; 20: 466-70. 36 Scott LJ, Mohlke KL, Bonnycastle LL, Willer CJ, Li Y, Duren WL. et al. A genome-wide association study of type 2 diabetes in Finns detects multiple susceptibility variants. Science 2007; 316: 1341-5. 37 Speakman JR. The ‘Fat Mass and Obesity Related’ (FTO) gene: Mechanisms of Impact on Obesity and Energy Balance. Curr Obes Rep 2015; 04: 73-91. 38 Speliotes EK, Willer CJ, Berndt SI, Monda KL, Thorleifsson G, Jackson AU. et al. Association analyses of 249,796 individuals reveal eighteen new loci associated with body mass index. Nat Genet 2010; 42: 937-48. 39 Stahl EA, Wegmann D, Trynka G, Gutierrez-Achury J, Do R, Voight BF. et al. Bayesian inference analyses of the polygenic architecture of rheumatoid arthritis. Nat Genet 2012; 44: 483-9. 40 Stutzmann F, Vatin V, Cauchi S, Morandi A, Jouret B, Landt O. et al. Non-synonymous polymorphisms in melanocortin-4 receptor protect against obesity: the two facets of a Janus obesity gene. Hum Mol Genet 2007; 16: 1837-44. 41 Turcot V, Lu Y, Highland HM, Schurmann C, Justice AE, Fine RS. et al. Protein-altering variants associated with body mass index implicate pathways that control energy intake and expenditure in obesity. Nat Genet 2018; 50: 26-41. 42 Vogel CI, Boes T, Reinehr T, Roth CL, Scherag S, Scherag A. et al. Common variants near MC4R: exploring gender effects in overweight and obese children and adolescents participating in a lifestyle intervention. Obes Facts 2011; 04: 67-75. 43 Volckmar AL, Han CT, Pütter C, Haas S, Vogel CI, Knoll N. et al. Analysis of Genes Involved in Body Weight Regulation by Targeted Re-Sequencing. PLoS One 2016; 11: e0147904. 44 Volckmar AL, Pütter C, Song JY, Graniger J, Knoll N, Wolters B. et al. Analyses of non-synonymous obesity risk alleles in SH2B1 (rs7498665) and APOB48R (rs180743) in obese children and adolescents undergoing a 1-year lifestyle intervention. Exp Clin Endocrinol Diabetes 2013; 121: 334-7. 45 Walley AJ, Asher JE, Froguel P. The genetic contribution to non-syndromic human obesity. Nature Reviews. Genetics 2009; 10: 431-42. 46 Wang T, Heianza Y, Sun D, Huang T, Ma W, Rimm EB. et al. Improving adherence to healthy dietary patterns, genetic risk, and long term weight gain: gene-diet interaction analysis in two prospective cohort studies. BMJ 2018; 360: k693. 47 Xiang Z, Litherland SA, Sorensen NB, Proneth B, Wood MS, Shaw AM. et al. Pharmacological characterization of 40 human melanocortin-4 receptor polymorphisms with the endogenous proopiomelanocortin-derived agonists and the agouti-related protein (AGRP) antagonist. Biochemistry 2006; 45: 7277-88. 48 Yazdi FT, Clee SM, Meyre D. Obesity genetics in mouse and human: back and forth, and back again. PeerJ 2015; 03: e856. 50 Young EH, Wareham NJ, Farooqi S, Hinney A, Hebebrand J, Scherag A. et al. The V103I polymorphism of the MC4R gene and obesity: population based studies and meta-analysis of 29 563 individuals. Int J Obes (Lond) 2007; 31: 1437-1441.